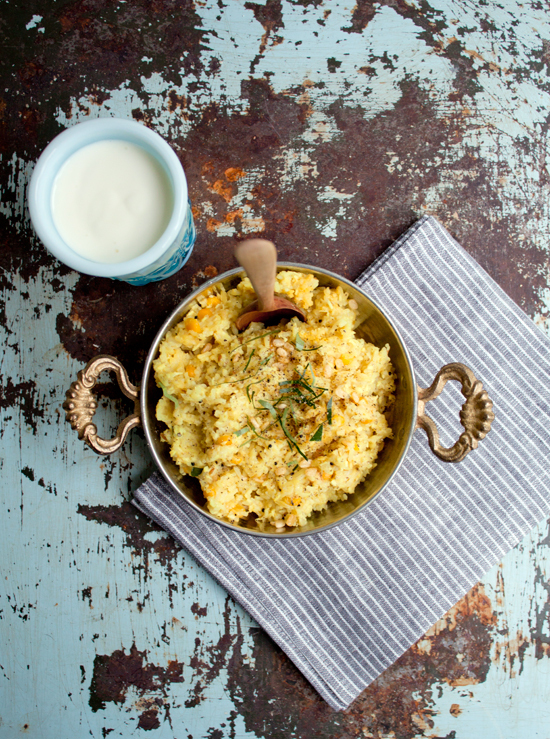 Pongal is a fabulous, quick, any-time-of-day base for a healthy and hearty meal. It's sort of like an Indian risotto. I first encountered Pongal at a typical family restaurant in Mysore, India. We ordered it by pointing at another diner's plate, our usual technique when we didn't understand anything on the menu. The mountain of glossy, creamy rice looked simple, safe and not too heavy. Well, After one bite of the mellow, risotto-like, savory rice dish, I was smitten. Pongal was a great breakfast, a refreshing contrast to the heavy, spicy curries we were eating for lunch and dinner. Little did I know that this sole plate of beloved pongal would be my last for awhile. Pongal is served only on certain days in Karnataka — had I realized this, I would have tried to eat my fill that first time, because every morning after upon my request for it, I was answered sadly with a head shake and a, 'no madam, only pongal on Tuesdays.' Inevitably, that would be a week from when I was asking for it and we'd be moving on to another city by then. Blast! No bother now though — I can have pongal all day long. After a little tinkering, I discovered the secrets behind this rather simple and delectable dish. It is lovely served with a curried vegetable of some kind: eggplant, okra ("lady fingers" as they're called in India), or green beans would all be nice. Or pongal can be served as is, for breakfast or a light lunch. So check out your local Indian grocery, gather your supplies and go ahead and make pongal anytime you please! Let me know what you think. 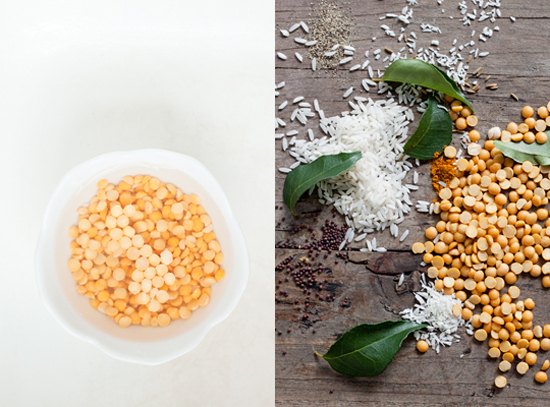 Cover lentils with water and let stand for 20 minutes (this ensures even cooking time for rice/lentil combo). Mix the lentils with the rice and coconut, and with about 3 cups water. Cook until soft, about 20 minutes. You'll know it's done when the texture is creamy, like risotto. You may need to add more or less water, depending on what type of rice you use and the freshness of your lentils. Meanwhile, heat a small sauté pan to medium and toast the cumin seeds, garlic, black pepper, turmeric, and curry leaves in 1/4 cup butter (or vegan butter spread). Heat mixture for about 2 minutes, until very aromatic. Set aside. 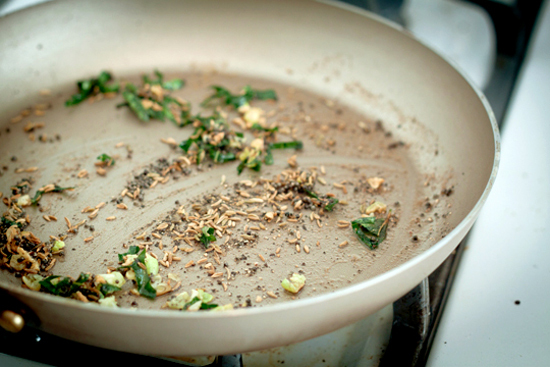 When rice/lentil mixture is cooked through, add the spice mixture, stirring to combine. Very nice with a sweet lassi or chai. i didn't know you could freeze the curry leaves, amazing tip. i buy mine from a random asian market, can't believe my luck on that. hope you are well out east! keeping warm. this looks absolutely amazing, i must try it. it reminds me of the "tempered rice" recipe my mom makes, which i posted recently on my blog. 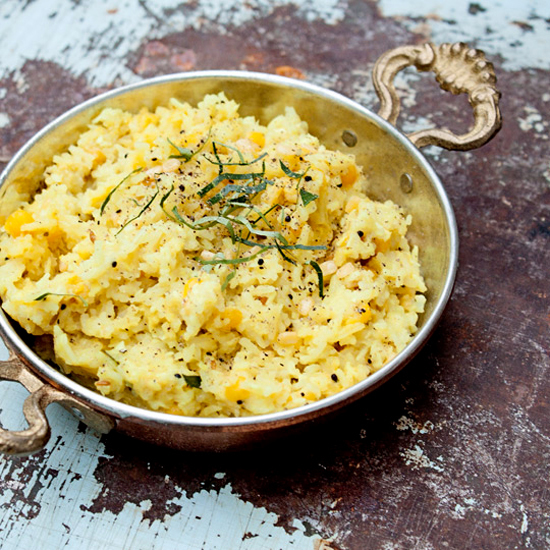 rice rather than lentils, lightly fried in butter that's been scented with curry leaves too. My question was going to be about curry leaves as well. I heard somewhere to use bay leaves as a substitution... I'm not sure that would do it though! I'll have to check some more local groceries, but I am definitely planning to try this. The coconut is what sold me. Thanks! This looks amazing! I'm gonna give it a try with buckwheat groats. Thanks for sharing! This good way to attempt for the consideration of the work and it work quality.